It's a fascinating documentary, whether you're a fan of Iggy Pop, Queens of the stone age, or neither. It's a film I'd definitely recommend watching. In 2016, Iggy Pop released an album written and recorded with Queens of the stone age frontman Josh Homme – Post pop depression. The album was intended to be something different to the usual rock fare that both men are used to, and in that they succeeded. American Valhalla is a film about the making of the album, with lots of interviews included. So far that sounds like the sort of thing you get on a DVD bonus disc, but this feels far deeper than that. It follows the process through from Iggy Pop talking about having the initial idea and how he approached Josh Homme, right the way through the album writing and recording process, and then on to the tour they did after the album was released. There’s video footage as well as interviews, and as well as the usual interviews, parts are just Iggy and Josh sitting together in an empty theatre talking about things such as David Bowie having died the night before Iggy Pop was due to fly to a rehearsal. 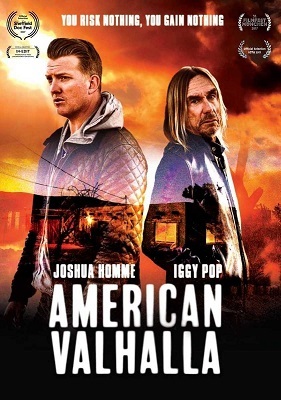 Both Iggy Pop and Josh Homme are very open, talking about their feelings at various stages in the project, and it’s that which makes this something more than the usual sort of “making of” type of film. It’s a fascinating documentary, whether you’re a fan of Iggy Pop, Queens of the stone age, or neither. It’s a film I’d definitely recommend watching.